If you are unfamiliar with the process of basement waterproofing, allow us to briefly explain it here. In short, it is a solution to a wet and damp basement due to leaky walls, although it offers additional benefits. You can reduce your energy costs and increase the value of your home. Should you choose to make your basement liveable, you will also be creating more space and even more value to home. In the end, you will easily recoup your investment. You will certainly not regret it. Even a small amount of water can lead to major problems in the future, including costly structural problems due to a cracked foundation and, perhaps even worse, serious health concerns. The problem is that water damage can go undetected for years. Signs that your home may be suffering from water damage include cracked walls, peeling paint and mould growth. A simple water leak can cause mould and mildew to grow. Left unattended, mould will continue to grow. It is an airborne fungus that enters our bodies as we breathe and can cause health problems as a result. It can cause headaches, coughing, stuffy noses and scratchy throats – typical allergy symptoms – as well as more serious allergic reactions and more severe problems like lung infections and difficulty breathing in more sensitive individuals. It can go on to cause potentially even more serious health problems with prolonged exposure. Fatigue and joint pain are only a few possibilities. Some believe that black mould releases toxins that are toxic to our health. The problem is that the longer the opportunity mould has to grow, the more difficult it is to remove. It can cause major disruptions to daily life and is also costly to remove. Mould is not well understood by the scientific community, which makes it even more frightening. Basement waterproofing, however, offers an effective solution. It will repair the leaks in your basement and by extension your health. It also prevents future water damage (and thus future mould growth). 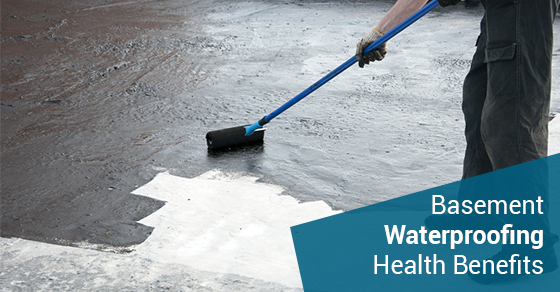 If you are looking for a professional basement waterproofing service, contact Brothers Plumbing today. We are one of Toronto’s leading plumbing providers, with over 50 years in the industry. Our services are available at very affordable rates and at a time that is right for you. Our basement waterproofing service uses some of the most advanced technology to protect your basement.